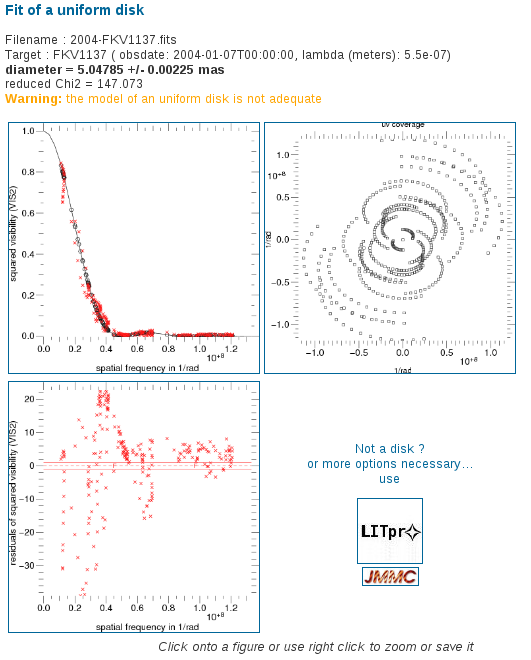 Call Iper to fit your OIFITS file of squared visibilities with a model of uniform disk. Iper is issued from LITpro and allows to rapidly see if your set of squared visibilities is compatible with those given by an uniform disk. Just select your oifits file and press the button to fit : a page with the results (numerical and graphical) is opened. For the fit, the initial value of the diameter is set to zero. For other initial values, use LITpro.